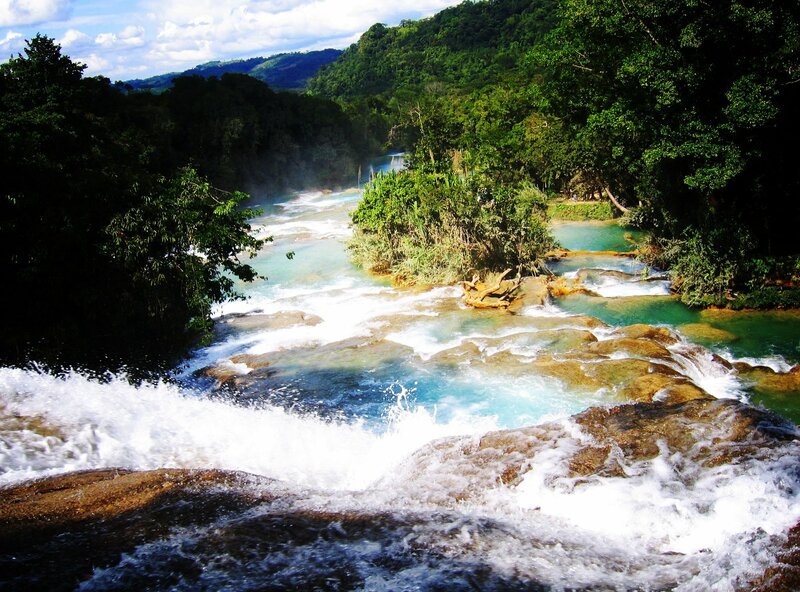 The Cascadas de Agua Azul (Spanish for "Blue-water Falls") are found in the Mexican state of Chiapas. They are located in the Municipality of Tumbalá, 69 kilometers from Palenque by the road that leads towards San Cristóbal de las Casas. This waterfall consists of many cataracts following one after another as can be seen in the first photo in the picture gallery, taken from near the top of the sequence of cascades. The larger cataracts may be as high as 6 meters (20 feet) or so. The one pictured to the right is next to the bottom of the sequence. The water is as blue as it looks in the pictures, and has a high mineral content. Where it falls on rocks or fallen trees it encases them in a thick shell-like coating of limestone. This can be seen clearly in one of the minor falls in one of the pictures in the gallery below, where the part of a tree that leans against the waterfall is heavily coated while the part further away is not coated. Some fully coated log shapes can also be seen inside the fall in that same picture, as well as coating on the rocks. Popocatépetl (Spanish pronunciation: [popoka'tepetɬ] ( listen); Nahuatl: Popōcatepētl [popoːkaˈtepeːt͡ɬ]) is an active volcano, located in the states of Puebla, Mexico, and Morelos, in Central Mexico, and lies in the eastern half of the Trans-Mexican volcanic belt. At 5,426 m (17,802 ft) it is the second highest peak in Mexico, after the Citlaltépetl (Pico de Orizaba) at 5,636 m (18,491 ft). It is linked to the Iztaccihuatl volcano to the north by the high saddle known as the Paso de Cortés. Popocatépetl is 70 km (43 mi) southeast of Mexico City, from where it can be seen regularly, depending on atmospheric conditions. Until recently, the volcano was one of three tall peaks in Mexico to contain glaciers, the others being Iztaccihuatl and Pico de Orizaba. In the 1990s, the glaciers such as Glaciar Norte (North Glacier) greatly decreased in size, partly due to warmer temperatures but largely due to increased volcanic activity. 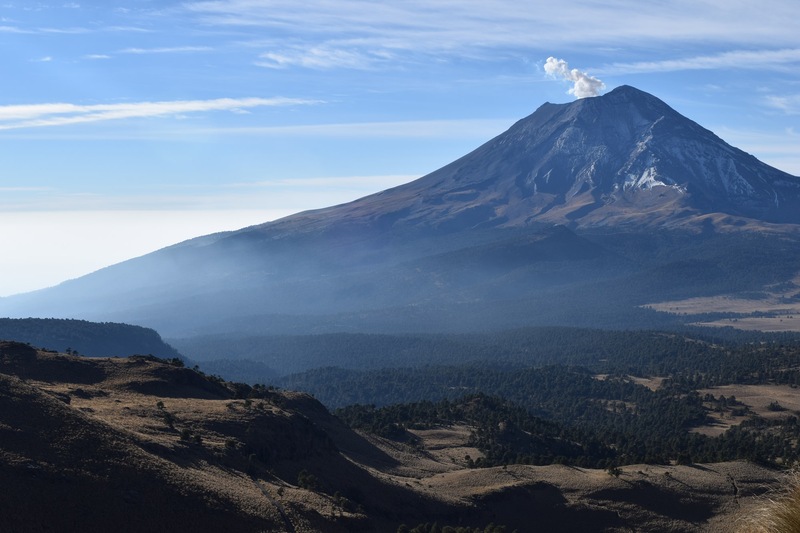 By early 2001, Popocatépetl's glaciers were gone; ice remained on the volcano, but no longer displayed the characteristic features of glaciers such as crevasses.